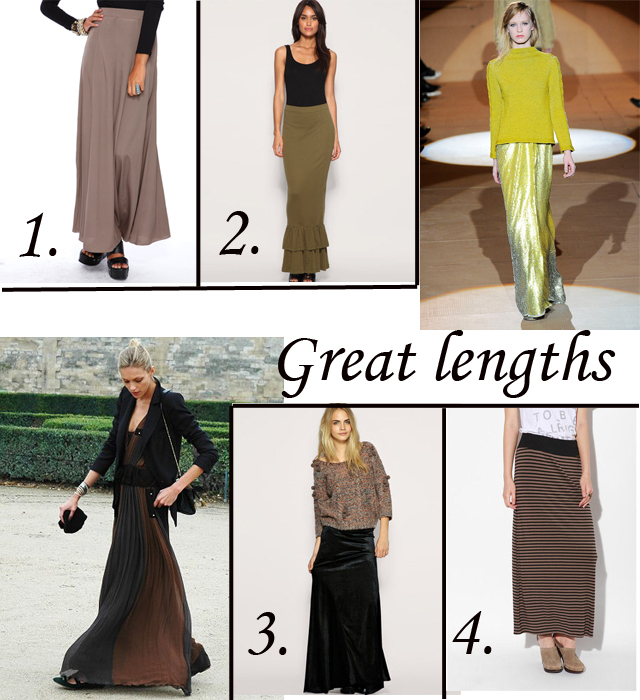 I fell in love with the maxi dress as a summer staple, and now I absolutely adore maxi skirts for this time of year. They go hand in hand with the romance and richness of fall, especially the velvet one. Skirts like the one from the Fall 2010 runway of Marc Jacobs and the brown and black dress in the streetstyle shot make me want to trapse around in long skirts and pretty dresses all the time. Wearing a blazer with one of these skirts would be such a chic look for work, while wearing a chunky knit or luxe sweater would be the perfect off-kilter, Alexa Chung-esque look.